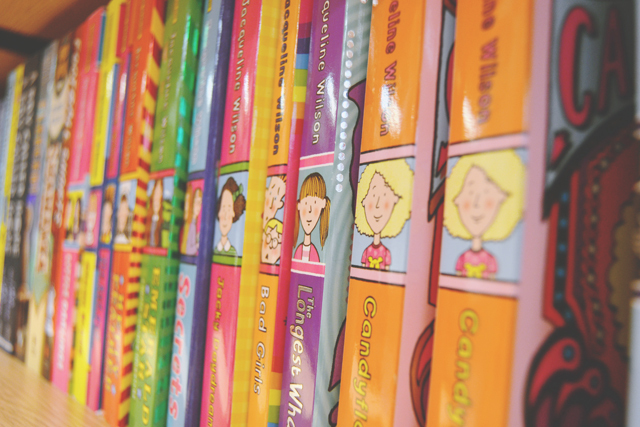 I'm a primary school teacher and I hate Jacqueline Wilson. There. I said it. Hate is a strong word, I know, but it applies here. Let me be clear first of all: I'm sure Jacqueline Wilson herself is a very nice lady. It's not she as a person that I hate, it's she as an author. I mentioned this briefly in my Classism and Grammar post, and it was suggested that I write a post on my feelings towards her. So here we go! Here's the deal: I'm 8 years old and my mum and dad have just divorced. I only know one other person with divorced parents so it's quite a new experience for me. My parents have shared custody so my little brother and I spend alternate weeks at each parents' flat. Every Wednesday, one parent takes us to school, and the other picks us up. This is normal to us and we love it. Our mum and dad have very different personalities so it's great to split the time equally between them. Suddenly, my life didn't seem so normal. I had a book in front of me telling me that I was supposed to be upset. Just look at the illustration on the cover. Dis this mean my parents didn't know what to do with me? Did this mean I didn't have a home? Far from feeling as if I had a book that understood my feelings and told me everything was OK, I had somebody whispering in my ear, telling me that my life was not normal and I should be sad about it. As I got older, I realised that this follows the same vein in all of Wilson's books. The Story of Tracy Beaker tells the story of a girl unhappy with her life in foster care. Double Act focuses on the pain of a mother being "replaced" after her death. The Bed and Breakfast Star deals with homelessness. Wilson has made her career writing books about children in vulnerable and difficult situations. Books that are then dished out to children in the same situation under some patronising concept that it might help them understand their feelings. Is it just me, or does that feel a little exploitative to you? I'm sure it's all very interesting for families in secure, stable homes to read and pity the characters in that situation, thinking themselves lucky not to be there themselves. But when you are the one in that situation, it's condescending. I refuse to read Jacqueline Wilson in my classroom. I won't have her books in my book corner. It might seem an overreaction, and yes, I'll admit that I have a personal vendetta here, but if one of her books made me feel like my life was wrong, and something to be sensationalised, why would it not happen to someone else? In fact, writing this, I remembered the Girls in Love series when I was a little older. At 11 years old, I identified with Ellie, because she knew exactly how many calories were in a Mars Bar and hated her "fat pink hams" of thighs. Come on, now. That's not right, surely? Validation that because I was a short, curly-haired, bespectacled, creative type, I should be insecure and want to change myself to be "cool". No, I'm not having that. It's not on. See, this is the problem I have with Wilson's books: They present children with characters they can identify with, in situations that they understand. And then they tell them everything that is wrong with their situation and why they should be unhappy with their lives. I want to see Girls in Love: College Edition when Ellie realises that she's looking damn fine in that miniskirt and aces university at the same time. Or The Fantastic Travels of the Suitcase Kid, in which Andy is glad her parents are both happy in their new homes, makes a fantastic group of friends in each location, spends her spare time exploring the area and ends up begging her parents to let the living arrangement continue until she moves out aged 18. Perhaps I'm oversensitive (OK, I'm almost definitely oversensitive) but I cannot feel comfortable with any book that allowed a young girl to doubt the social acceptability her life. I'm sure I can't have been the only one. I completely agree with this! I used to love them when I was younger, but any time I've attempted to go back and read one, I've realised how awful they are, they seem so overly sensationalist, like a children's daily mail. I would probably do the same in my class if I were you, definitely wouldn't say you're over reacting at all! I'm planning on being a primary school teacher too, have you done any posts on your journey to be one? If not, I'd be really interested in reading one! "Like a children's Daily Mail" You hit the nail on the head there! I can't say I feel the same way. I love this take! Very interesting. I'm going to disagree with you, but only because I love a book debate and happen to have a difference of opinion, not because I didn't respect your opinion :) I had a basically crappy childhood and I remember reading these books and thinking wow, there's somebody else out there like me (and worse!) and not just my friends who all seem to have a mum, dad and nice home life. And the books all had injections of humour in too, and a happy ending and were, at the end of the day, just fiction so I never really applied it to my own life too much. As an adult looking back I can now see your viewpoint and yes if you're a child that's been in care or been through a divorce that is happy you might think 'well aren't I meant to be?' but I'd hope that a child would have enough about them to just take it as a piece of fiction and not an instruction, and hopefully parents and teachers can explain that too. I'd also love to see the books you mentioned, but I suppose if those children are already happy in their lives then they won't be the children desperately searching for some solace in books, that'll be the Tracy Beakers of the world. Haha I love a book debate too! It's interesting that you had a similar childhood experience but did identify with them. Perhaps it's because I was perfectly happy with my situation that I found them exploitative. If I'd been unhappy, I might have identified more but instead I was made to feel like my emotions were wrong. Unfortunately, children are very impressionable and don't always have the analytical level of thought required in order to take work as merely a piece of fiction. As an anxious, nervous and introverted child (although happy with my living arrangements), I did seek solace in books and found Wilson's just made me doubt my own emotional reliability. Thank you so much for your comment- It really made me think! Okay; so, I adore Jacqueline and it was a positive part of my childhood for me, the outlet of reading took me away from a reality that was rather grim. BUT; I never really experienced anything the protagonists in each story had gone through - so now I've read your post I'm actually seeing each story from a completely different point of view. Especially as children are so easily impressionable; I completely understand your point; children relate to characters personally, and if they do not feel the same as their favourite character then it can become really confusing for them. I think Jacqueline hoped to just help children who were struggling through this rough time - showing them there's a happy ending; but she clearly fails to address the children who feel differently about their situation. This is a brilliant post Becky! Thank you for showing me another point of view! It's interesting that most of the comments from people who enjoyed her books are coming from people who didn't experience the issues. Although they did a good job to raise awareness of social issues in the world, I do think she went about it the wrong way. I've loved Jacqueline Wilson's books since I was a child, but this post has really made me stop and think - I never really looked upon her work in that way at all, and in some cases I identified with her characters because I felt as though my life was wrong, too. As an adult I can quite clearly understand the problems you're pointing out and in a lot of ways I do agree with you - no child, however unique their situation is, should be made to feel as though their life and feelings are wrong. It is hard to suddenly realise an author I used to adore has exploited these situations quite so blatantly! They were probably great for people who felt the same way as the characters, but for me it just felt confusing, and like my world was all wrong. This is a really interesting stance on JW. I have to say that I, on the whole, had a v.positiveJW experience when I was younger - I loved the 'girls in love' trilogy (things do turn out alright for Ellie in the third book). However, I remember they made a tv series of it and the girl who played ellie was neither bespectacled or curly haired and I was hugely pissed off (I identified with Ellie in all but the curly hair)! YES! The girl who played Ellie was nothing like her character should've been. Plus Madga wasn't a white, mousy haired girl who dyed her hair all the time - Zaraah Abrahams was a strange casting, although she was pretty good in the role! The girl who played Nadine was the only accurate one! I'm so glad to hear Ellie turned out alright in the end! I read the first two but they made me too depressed so I didn't read the last one! I feel exactly the same way, Becky - when I was younger, my friends would always be reading her latest books, signing up to her fan club (with parental permission, of course), going to her events and parading around the playground with their signed copies - but I never understood why. I read a few of her books, but I always felt that they treated these situations in an unrealistic way that wasn't engaging, nor inspiring. I didn't like her prose, either; each of these children sounded exactly the same, each just as flimsy and shallow as another. Everything was so melodramatic and it made me question whether some people's lives were really like this (and if people still talked in that way, haha). My friends, who had never been through the experiences of these characters, suddenly thought they knew everything about divorce or homelessness or an irresponsible parent. This made me realise how impressionable kids are and if Jacqueline Wilson is a children's author, she needs to understand the responsibility she holds in being honest, positive and teaching good morals and values. I'm so glad it's not just me! You're so right about the characters- They're all the same! I totally agree with you on Wilson's responsibility as a children's author. 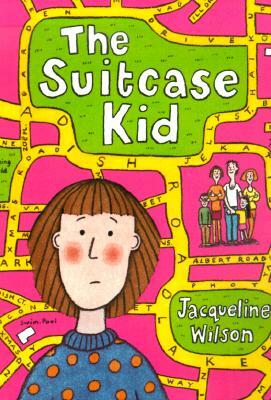 I love Jacqueline Wilson growing up. Her book Lola Rose helped me so much when my gran got cancer, it made me know I wasn't the only child in the world who was going through it other children had. I didn't enjoy the suitcase kid though or Tracy Beaker. I loved the Girls series but when I re-read them when I was older I realised how much influence they had on me, I thought it was normal to make yourself sick now and again to make yourself feel less fat cause other girls did it. They could be seriously damaging to young girls, I bet she never thought about that when she wrote them. I could never read them again, not now the writing style is so poor and the stories just don't appeal anymore. I'm really glad they helped you. It seems like they were fantastic for people who could identify with the characters but, unfortunately for me, I didn't at all and it made me doubt my own life. I remember my body insecurities started around the same time I was reading the Girls series and I've always wondered if they were related. The scene in which Ellie walks past the boy she fancies in a miniskirt, then sees her "wobbly pink hams" of thighs in a reflection really struck a chord with me, and that's always stayed with me. My thighs have always been the part of my body I've hated the most, and I think that book had a very large role to play in it. Not to mention the fact that I had frizzy hair and glasses, so I was clearly meant to feel superior next to my tall, slim, blonde best friend! I LOVE this. I'm a bookseller and have so many parents and children telling me how amazing Wilson is. Honestly I tell them to put the books down and steer them towards something like Cathy Cassidy where there are young girls in real situations, or Geek Girl about an amazingly intelligent girl who becomes a model but still retains her geekiness. I LOVE YOU FOR THIS! Seriously, thank you so much for encouraging people to buy other authors. I think people need to break out of the Wilson box. I've never read Geek Girl, but it sounds like it has SUCH a positive message! 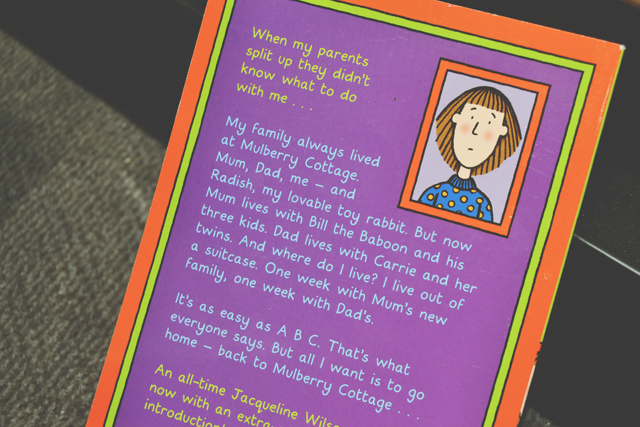 I loved Jacqueline Wilson when I was younger, but I'd never really noticed all of this! I guess as I'd never experienced those situations myself, I didn't think too deeply into it at the time and they didn't affect me. I guess you could say I was quite ignorant then really. At that age, I didn't think about people who are actually in those 'bad' situations. From what you've mentioned, I can see now how the books would affect some children! You've really opened my eyes to it! I'm glad I read this post. All children are born ignorant, and they should stay ignorant as long as possible. For a child to live an ignorant childhood, they must have had a happy childhood. Growing up I saw Jacqueline Wilson as a mentor and counselor of types. I think it was an incredibly good and kind thing to write books aimed at those whose lives are deemed by society as unacceptable or undesirable. I didn't feel she ever suggested certain situations were wrong or right, but simply difficult to come to terms with for some. I personally have found comfort in the pages of almost all her books. I'm sorry this wasn't the case for you; that you didn't identify with the viewpoint of another character who went through similar circumstances to you. However I know many others who did, many who'd find solace in the knowledge they weren't alone. I found her books to be honest and her characters admirable. And I think it is a beautiful thing when we can identify with the feelings of another and empathize, regardless of their situation or ours. I'm so glad you had a positive experience from her books. I just wish I had. Such an interesting perspective AND a concept that I support massively! Skimming over other people's comments I realise that Wilson may have offered some form of comfort to others but I definitely felt uncomfortable indulging myself in her fictitious problems - some of which felt dearly personal to me. Creating some kind of 'moral tale' or 'fable' at the expense of vulnerable children. Bravo! As a divorced father of two with a partner/step-mum, I've found JW's books to be potentislly damaging. Fathers are feckless. There's always a 'hole' that would only heal if dad would just return! The problem is that the books are simplistic in their assumption that the nuclear family must always be the default model, and that any other scenario is somethow a situation that must be struggled through and overcome. There are a vast number of mixed families that could do without the implicit moralising that Wilson dishes out.